Nixon Motor Sports: Australia Formula 1 Race: Winners/Losers! There are always winners and losers in auto racing, but beyond just naming 1st place and last, let's take a look at how what happened in the race in Melbourne turned out with expectations. Mercedes team: Their drivers Lewis Hamilton and Nico Rosberg took first and second places in qualifying, and held them to the end of the race, so it certainly looks like this season will turn out like last year with Mercedes way out in front. Ferrari: After just one race, their new driver this year Sebastian Vettel (make that "four time world champion Sebastian Vettel") has already matched the BEST performance of Ferrari last year, both with his 4th in qualifying and his finishing 3rd in the race. After last year when Ferrari didn't win even one race, this can be taken as a big step in the right direction. It's not winning races or championships, but a big step in that way. Sauber: Their team has been in F1 for many years, but last year was their worst with exactly ZERO points. Now, after just one race, they are way ahead of that pace, with Felipe Nasr finish in 5th place and their other driver Marcus Ericcson also scoring points in the top ten! Glad to see them scoring points! McLaren: This one is hard to explain, because only one of their two cars even finished the race, with Jenson Button crossing the line in last of the cars still running, but amazingly there were only 11 cars still running. Yes, that also means he didn't score any points, but given that they had the worst pre-season testing results, and had not gotten their new car with new engine supplier Honda working hardly at all, just getting one car to the finish line of all 58 laps counts as "winning" for McLaren. From here though, winning will have to be defined as scoring points and getting both cars to the finish line, ideally with their currently injured two time champion driver Fernando Alonso. F1 App: There is a great App for following F1, and it comes in two versions. Even if you just get the free one, it gives you live timing of practices, qualifying, and races, plus other interviews and videos of F1 happenings. If you're willing to spend about 26 bucks, you also get way more live coverage during races, such as the live race call, live radio talk from the teams and drivers, etc etc. Well worth it if you are really into F1 racing. 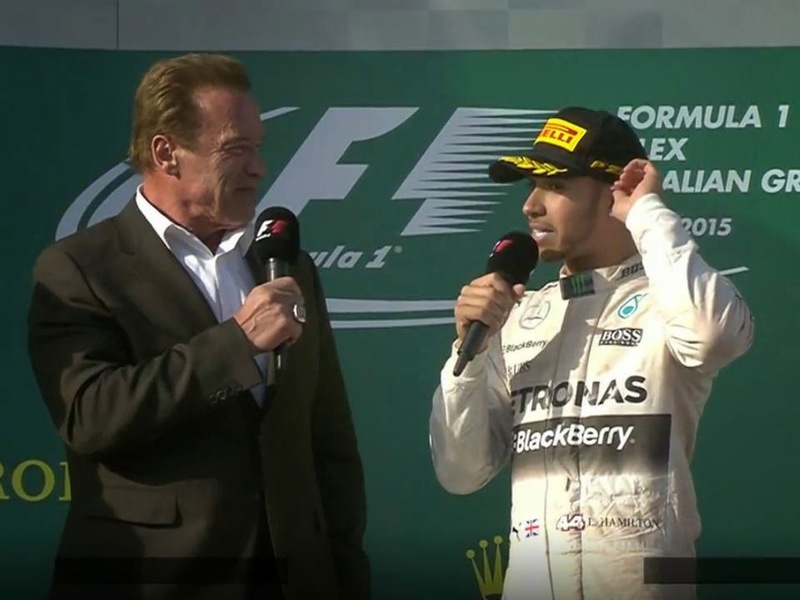 Famous Guys on the Podium Ceremony: Sir Jackie Stewart and Arnold Schwarzenegger appeared during the podium ceremony, Sir Jackie to present one of the trophies and Arnold to conduct the top three driver interviews. Hey, for a former world champion bodybuilder-actor-governor, he did a good job with the questions, as if he'd spoken in public before! Let's have Arnold at all the races! Williams: Through practice and qualifying it looked like Williams would be big winners, with both Felipe Massa and Valtteri Bottas doing well, and qualifying 3rd and 6th. However, it turned out that Bottas was injured during qualifying and was then unable to race, leaving Williams with only Massa to start. If he could have held his 3rd and finished on the podium I think it would have been nearly a win, but he got passed by Vettel and finished 4th, just off the podium. For the amount of promise they showed before the race, this is a bit of a loss for Williams. I hope that Bottas quickly recovers, and during the rest of the season I think we'll see him finishing on the podium multiple times just like last year. Red Bull: Not a great day for Red Bull, not a terrible day, but home town Australian driver Daniel Ricciardo was hoping to place better than he did, and their 2nd car of Daniel Kvyat was out of the race before it started with some type of mechanical problem. From winning the world championship 4 years running from 2010-2013, they are not a happy bunch of campers at this point. Maybe the problem is the Renault engines. Lotus: Well shoot, Lotus was having a great pre-season and qualified both cars in the top ten today, and then BAMMO the race started and Pastor Maldonado got hit and was out of the race and was out at turn 1, and then Romain Grosjean had a problem of some sort and was out of the race just a few laps later. Surely they will turn this around and score regular points the rest of the way.